Cooper Wine Company, located on Red Mountain, is a new winery that had its first releases at the end of 2009. The winery is named after owner Neil Cooper. Cooper had been working in the farming and seed business for ten years when he felt it was time for a change. With lots of involvement from “corporate America” as well as a downturn in the economy resulting in a surplus of seeds, he began to look elsewhere. Sometimes bad circumstances provide the best inspiration. “As the economy continued to remain uncertain, I made an inconceivable decision to shut down farming operations and put all resources into the wine business on Red Mountain,” he says. Cooper met Fidelitas winemaker Charlie Hoppes in 2002 through a mutual friend. When he decided to enter the wine business, turning to Hoppes as consulting winemaker was a logical choice. Enthusiastic, humble, and immediately likeable, Cooper - Coop to his friends - describes himself as a novice at winemaking saying “I am…on a very quick learning curve.” While he expects his influence on winemaking decisions to grow over time, he intends to continue to take advantage of other’s expertise in the future. Cooper Wine Company focuses mainly on Bordeaux-style reds using fruit from exceptional vineyard sources including Champoux, Weinbau, Boushey, and Stillwater. The winery has released three wines from the Columbia Valley: a Pinot Gris, a Cabernet Sauvignon, and a Bordeaux-style blend called L’Inizio (“the beginning”). A Walla Walla Valley Cabernet Sauvignon from Windrow Vineyard will be released in the future which Cooper is extremely excited about. Fans of Charlie Hoppes style will notice his hand here on these intensely flavorful, focused wines. Cooper Wine Company made 500 cases in its first vintage (2007), 1,000 in its second, and 1,650 last fall. Cooper anticipates reaching about 2,500 over time. The winery is set to have its grand opening in April. Rating: * (Excellent) An appealing nose with tropical fruit and light spices. The palate has a very pleasing weight to it without being heavy. A healthy dollop of fruit rounds out this perfect summer wine. 100% Pinot Gris. Goose Ridge Vineyard. Aged mostly in stainless steel. 100 cases produced. Sampled at 63 degrees. Rating: * (Excellent) Nose marked by coffee, vanilla, cherry, and light oak spices. A creamy mouthfeel on a wine that is richly flavored with fruit. Shows a fair amount of oak aromas and flavors at times, especially as it warms up. 54% Cabernet Sauvignon, 30% Merlot, 10% Malbec, and 6% Petit Verdot. Weinbau, Conner Lee, Northridge, Champoux, Stillwater, Red Mountain, and Boushey Vineyards. Aged in new French (60%) and American oak (40%). 14.9% alcohol. 200 cases produced. Sampled at 64 degrees. Rating: * (Excellent) A subtle nose with cherry, light oak spices, and high toned coffee notes. Tightly compact with rich cherry fruit on the taste. Finish lingers. Needs time to open up and expand but a beautiful wine that is a pure expression of Washington Cabernet. 100% Cabernet Sauvignon. Aged in new French (60%) and American oak (40%). 14.8% alcohol. 96 case produced. Sampled at 67 degrees. Note: Wines sampled as part of a ‘Tweetup’ of Seattle-area tweeters. The tasting took place in Bothell at Russell’s Dining (@RussellsDining) and was set up by @DivaTink with @coop_cwc pouring the wines. Attendees were @SeattleWineGal @TarynMiller @Shona425 @NicoleEvents @YasharSeattle @LittleBlue (let me know if I missed anybody). The tasting used the hashtag #coopwine. Thanks for the write up Sean. It sounded like you guys were having a lot of fun at the tweet up last night. 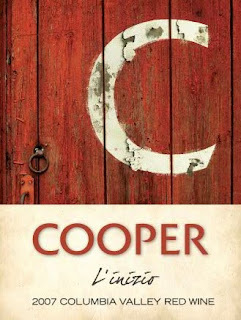 I have not tried Cooper's wines yet, but they are on my short list. Hopefully I will get to at Taste Washington this year if they are going to be there. Melinda, indeed a good time was had by all at the Tweetup. Don't see Cooper's name on the list at the moment for the ToW but check in with the winery. Definitely one to keep an eye out for. Thanks for the comment. I bet they are as good as you have rated them. Cityroute16, definitely give them a look. Thanks for the comment. I had the distinct pleasure of meeting the winery owner of Cooper; he graciously gifted a bottle of the L'inizio 2007 Columbia Valley Red Wine to me as he is the next door neighbo of one of my clients in Richland (woof!). The wine is FABULOUS!! Where can I get more? Glad to hear you got to check out the L'Inzio. I'm not sure who distributes their wines, so your best bet might be through the winery. This was a super fun night! So long ago now..... thanks Sean reminding me of the early days. Wasnt Annie there that night? That was a fun night CC! Hard to believe it's eight years ago already. I don't believe Annie was there. I don't believe I met her until that summer.